MTM’s AC4C is a Rugged tactical sporting crate for multi-caliber ammo storage and transport. Comes with four, O-ring sealed 30 Caliber ammo cans (AC30T) for multi-caliber ammo storage. 30 Caliber ammo cans are a convenient size to store all kinds of bulk ammo. The one drawback is, that they’re more straightforward to knock over than the bigger ammo cans. Now you’ll stack them as tall as you need in these specialised crates. Product of rugged polypropylene to last. Stackable and strapable with four tie down spots for ATV attachment. Showing up at the vary with one these, can be like pronouncing, don’t ?#%! with me. 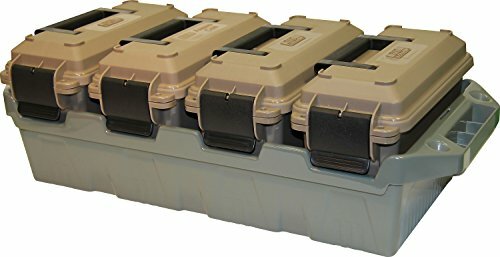 AC30T ammo can features come with: • Water resistant O-ring seal • Double padlock tabbed • Molded-in stacking ridges • Heavy-duty, latching systems • Within: 3.4”(L) x 8.nine”(W) x 6.1”(H) • Out of doors: 5”(L) x 11.3”(W) x 7.2”(H) • Designed to carry as much as 15 pounds of ammo All MTM Ammo Crates & Cans are made in our factory in Dayton Ohio. They’ll have molded into the plastic at the bottom “Made in USA” marked on them. Watch out for the imported knock offs.